Aluminum awnings are a great way to get protection from the elements all year long. They are a perfect option that requires little to no maintenance. Offered in a variety of shapes and sizes to fit your home or business. 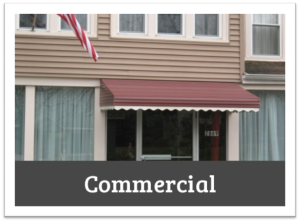 Commercial: Aluminum entrance, door, and window awnings are great was to add character to any business. With year round use they require little to no maintenance. Create a large aluminum entrance awning to keep customers dry all year long. 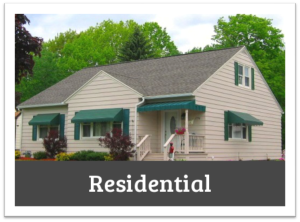 Residential: Adding awnings to your home is a great way to add shade and protect your home from the elements all year long. Once installed our residential aluminum awnings require no maintenance. Car ports are also a great way to keep you vehicle sheltered from rain and snow. Jamestown Awning and Party Tents offers Aluminum awnings in Jamestown, Lakewood, Mayville, Westfield, Chautauqua, Bemus Point, Ripley, Findley Lake, Warren, Dunkirk, Fredonia, Bradford, Salamanca, Alleghany, Olean and many other areas throughout Western New York and Northern Pennsylvania. We have created thousands of awnings since 1964. There is no job too big or too small! Call us today to get your Aluminum Awnings!